What Are Kids Concrete Poems? Well, they are not poems made of concrete! Kids concrete poems are just poems written in a shape. We think they are a fun way to write kids poems. The best part is that these poems don't have to rhyme but can if you want them to. 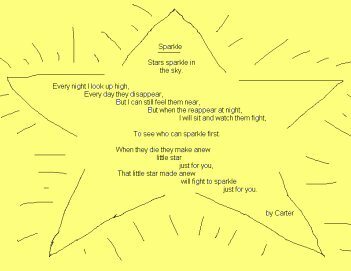 Keep reading to see examples of concrete poems and how to write your own or listen to some funny rhyming poems, holiday poems and more! Here's a few examples of kids concrete poems that we wrote. 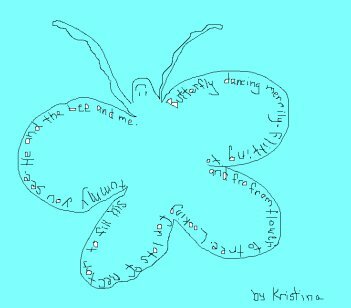 See, we just drew a butterfly and then wrote our short poem inside the shape of the butterfly. This star poem I wrote for school and it was published in a book of poems for children! See how you can fill the shape in with the words? 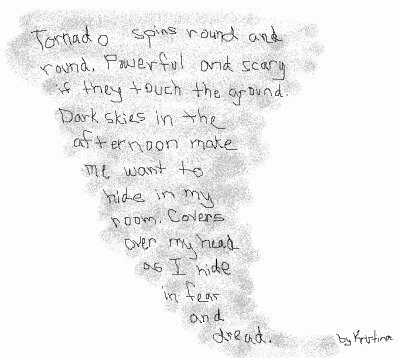 There was a huge tornado in our town a few years ago and this kids poem tells how we felt and how we still feel when the skies get dark. That's the cool thing about poems, you can say whatever you are feeling and draw a picture to go along with it. 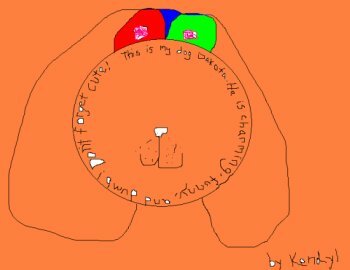 This is a poem I wrote about our dog Dakota. He is the best dog ever. He's a boxer and they are known in the dog world to be big clowns which he sure is! If you like clowns and funny things you may like these short funny poems! Concrete poems can be very flexible, see how I didn't fill out the whole picture with words this time? You've seen ours. Now it's your turn to write a kids concrete poem! Grab a pencil and a piece of paper or use a drawing program on the computer. Think about what you want to write about. Is there something that makes you happy? Or maybe you're sad or scared about something - like we were scared about the tornado? Got it? Okay, now just draw a picture of what you're thinking about. Don't try to make it perfect because no one is perfect, just do your best! On a separate piece of paper write your poem. Remember it doesn't have to rhyme unless you want it to. Just write what comes to mind when you look at your picture. If you need to write a second or third draft go ahead, take your time. When you're satisfied with your poem think about how you want it to look in your picture. Do you want to fill your picture in with the words, write the words around your picture, or make the words the shape of your picture? When you've decided, go ahead and write it on your picture. You did it! You wrote a kids concrete poem! That wasn't so hard was it? I bet you even had fun! Want us to publish it on our website? Click here to submit it to us and we'll let you know when it's live! If you still need help writing some poetry we think these books are pretty cool!